"If you like your power pop fast, catchy and just a little off center, you’ll really dig the latest from Broken Promise Keeper. Eleven tracks in all, BPK emphasizes the power in power pop and we, the listeners reap the benefits." "BPK has been a reliable purveyor of power pop for many years and his latest self-titled album still delivers the goods... There are plenty of decent songs here (no real filler) so give this one a chance!" "A Broken Promise Keeper record is like that video of a mountain bike tearing down the side of a cliff, or one of those sky divers in the flying squirrel outfits jumping off the Matterhorn. Pure adrenalin." "BPK doesn't break the promise of prime power pop... the sound here is similar to fellow southern power poppers The dBs and Scott's Garage." "BPK strings all his songs together in one overwhelming sugar rush that will leave you exhausted but happy." "Powerpop played with conviction... Highly recommended!" "Good pop that goes down smooth... a retro-80s powerpop sound that adds a level of wit and whimsy to the proceedings." "This is required listening in the powerpop universe." "Startlingly good... one of those bewildering discs that is so full of sound and harmonies that you find it difficult to believe that a single guy is behind it all... "
"Classy and beautifully rendered powerpop — witty, smart, melodic and imbued with pretty twists of melody..."
"Old school, good school. VERY highly recommended!" "Straight-ahead pop rock as addictive as crack — #4 on my list of 2009's top powerpop albums." You know, music that combines the power of basic rock and roll with pop smarts in the form of catchy hooks, clever lyrics, and vocal harmonies. Music that makes you want to sing along, drive a little faster, and play that song again but a little louder. BPK's tunes have gotten the attention of those who follow the genre and his two recent albums — Poptimized and Ice Cold Pop — were ranked among the year's best powerpop releases by a number of critics. 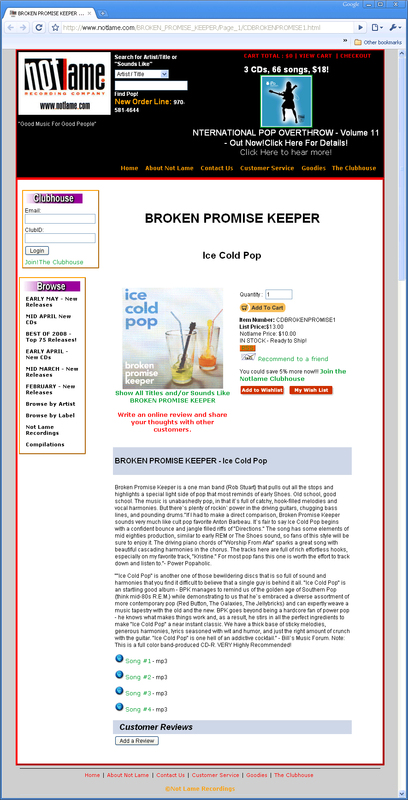 Yup, in March 2016, BPK put out his eponymous fifth album, Broken Promise Keeper. Like his other works, the 11 songs are all built on a solid foundation of melodic bass and driving drums and feature a pumped-up mix of crunchy and jangly guitars, keyboards, and vocals. BPK's tunes have been praised for their combination of lyrical humor, enthusiastic delivery, and clear love of powerpop. Mixing influences from the 60s British Invasion (the Beatles, the Who, and the Kinks) and the 80s Southern Janglepop era (REM, Let's Active, and the dB's), BPK delivers something that's both new and familiar. Take a listen for yourself; you can stream all of BPK's music for free. And if you like what you hear, you can download songs or albums from iTunes, eMusic, and the rest. If you want a old-fashioned, hard-copy CD, you can pick them up from Ray at Kool Kat Musik, the best online source of powerpop and alt-country around.